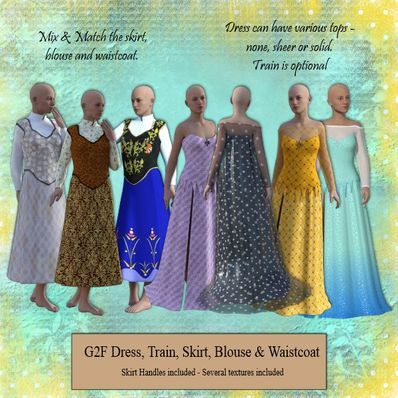 Movement handles for the skirt, dress and cape included. Sorry no. Upgrading isn't that easy when the two figures are different sizes. The garments have to be refitted to the figure and rerigged etc. I haven't tried it yet, but you could try using Autofit on G3F. Thank you! Any chance you could upgrade this for G3F? This is beautiful, thank you for your generosity. I love this so much! Thank you for your generous content creation. This is stunning also. Thank you. Both of my granddaughters love the movie. Thanks.